This article was originally written by Will Jarvis and appeared in The Maneater on October 7, 2015. It has been republished with the author’s permission. Drew Lock heard the chants. The Lee’s Summit freshman basketball player stood just feet away from an entire student section mocking his pretty boy, shaggy-haired demeanor. This was crosstown rivalry basketball at its finest. Lee’s Summit West students were relentless. If Drew Lock touched the ball, the Justin Bieber chants would commence. Standing in that student section, leading the Bieber-shaming chorus was burly high school senior Evan Boehm. All 6-foot-3, 300 pounds of Evan Boehm were in the freshman’s ear. Screaming with the fiery passion of an offensive lineman, the senior tried everything he could to get in the 15-year-old’s head. His efforts were unsuccessful. The Bieber-haired shooting guard put his toes behind the three-point line, and with Evan Boehm howling just feet away, he drained a three. Four years later, a lot has changed. Instead of jeering at Lock, Boehm now blocks for him. They’re not at rival high schools; they play together for their state’s university. The hair? No, that hasn’t changed one bit. Boehm, a senior captain for the Missouri football team, has taken his fellow Lee’s Summit native under his wing. Acting as a mentor for the Tigers’ first starting true freshman quarterback in two decades, the man who snaps the kid the ball has made sure Lock’s transition to college football has been as smooth as possible. “I don’t think there’s any question that having an experienced center like Evan there is a huge plus,” coach Gary Pinkel said. The two first met after that basketball game four years ago. Boehm, who had already committed to Missouri, talked to the freshman. Lock knew of him. Boehm was Kansas City high school football’s biggest star. He’d won the Thomas A. Simone Award, annually given to the Kansas City area’s most outstanding football player. He’s the only offensive lineman to ever receive the Simone award in its 32-year history. Needless to say, the lanky freshman was intimidated before he ever said a word to him. As badass as Boehm was, Lock still despised him. After all, this was a high school football rivalry on the line. Respect? Yeah, that’s one thing. But it doesn’t mean you have to like the guy. Little did he know, three years down the road, Lock would win that same honor and commit to the same university. It’s the first time in the history of the award that two winners hand the ball off to one another at the college level. Center to quarterback or quarterback to wide receiver. It’s never happened until now. That Simone bond brought the two together for Lock’s official visit. Quarterbacks coach Andy Hill had Lock stay with Boehm for a weekend. The weekend of his visit, Lock played his future center’s alma mater in basketball. There was no Boehm in the stands making Bieber chants. Instead, Boehm welcomed the highly recruited quarterback to Missouri. Once on campus, free laundry was the bait for Lock. Anytime, Boehm told him, he could come over and do laundry. No residence hall fees. No having to wait for an open machine. Just throw some dirty clothes in the wash and hang out. Lock takes advantage of these things. At first, it was laundry, but now, the common texts will just be to hang out. Boehm also appreciates his time with the 18-year-old who’s stolen the spotlight. He joked they “Netflix and chill” when Lock comes over. As a true freshman, Boehm started, too. He knows what Lock is experiencing. He knows Lock will make mistakes. It’s inevitable when making the transition to the college level. The center had his fair share three years ago. When Boehm was a freshman, he had a similar mentor relationship with lineman Elvis Fisher. 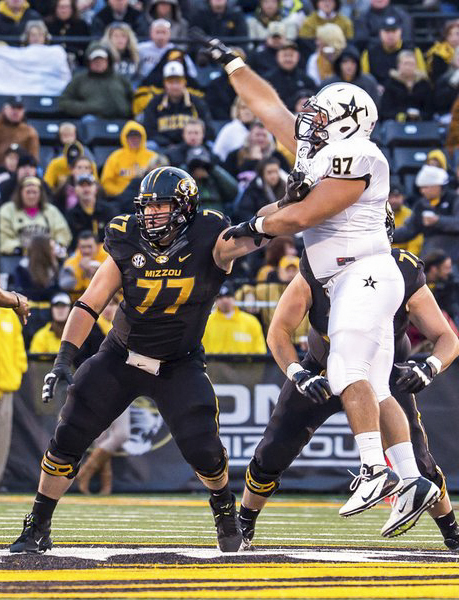 As Boehm’s “big brother” in the Missouri program, the two were nearly inseparable. Looking back, Boehm stands in those same shoes. Having fun is a top priority, which is why he likes to take the occasional jab at his young quarterback. Recently, Boehm saw a Vine of Lock whipping his hair in the wind before a game. It was a perfect opportunity to give his QB1 an ego check. Even on the field, he likes to have fun with the freshman. After Lock was sacked for the first time against South Carolina, the offense met on the sideline. That sack, Boehm told Lock, was his initiation to the Missouri offense. “I guess I’ll take it for what it’s worth,” Lock said at media availability Monday. The true freshman quarterback looked up over the swarm of press members. There was Boehm, extending his iPhone over the herd of reporters, trying to get a question in. “Oh, there he is,” Lock said with a laugh. “Do you still hate me?” Boehm asked, referring to their high school football days. The younger Lee’s Summit native cracked up.